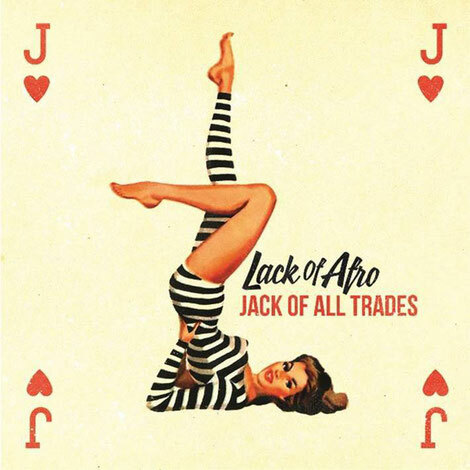 Multi-instrumentalist, composer and producer Adam Gibbons (aka Lack of Afro) gets set to release his sixth studio record ‘Jack of All Trades’, an album that combines soul, funk, hip-hop, disco, rock and everything in-between, all wrapped up in chunky production to create arguably his finest work to date. The album contains various vocal performances, including from regular collaborator Elliott Cole, Nick Corbin (formally of New Street Adventure), ex I Am Giant vocalist Ed Martin, Wax & Herbal T, Alyssa Marie, Camila Recchio, Juliette Ashby & Emma Noble. Classic soul (‘Back To The Day’, ‘Reach Out’), hip-hop (‘Back In Business’, ‘Take It Up A Notch’), disco (‘Only You & Me’), rock (‘Over & Out’), modern soul (‘Baby Be Mine’), folk (‘Home’) and a dose of funk (‘The Messin’ Around Intermission‘, ‘Good Love’), all combine to create an album of variety. Full of horns and strings (and all recorded onto tape through a 1970s mixing desk), the album blends old and new while ensuring that the songwriting takes centre stage. His 2016 release ‘Hello Baby’ picked up a BBC 6 Music ‘Album Of The Year’ nomination and appeared in the Top 10 of the iTunes R&B / Soul chart in 21 countries worldwide. His music is also apparently in high demand across all aspects of film and TV, by networks such as ABC, Fox, NBC, Sony Pictures and the BBC. More recently he has signed to licensing label A Remarkable Idea, an imprint of Universal Music alongside artists such as Maximo Park, Pulled Apart By Horses, Alt J & label boss Benson Taylor. A remix of his 2011 song ‘P.A.R.T.Y’ by French duo Ofenbach was released on Warner Music in March, whilst his debut album ‘Press On’ (2007) has just been given ‘classic’ status by Future Music Magazine. It’s out 10 August on LOA Records, you can check it out on Spotify here.